Today, Thursday, March 23rd, Congress will vote on whether to use a special legislative mechanism called the Congressional Review Act (CRA) to roll back the FCC’s landmark broadband privacy rules for Internet Service Providers (like AT&T, Comcast, and Verizon) that many of us fought hard for last year.. The 22 senators behind this controversial resolution have received more than $1.6 million from the very same companies that would profit from this. This is going to be a close vote. Below are the names, numbers, and twitter handles of key members of Congress who could vote to uphold current broadband privacy rules. Dear @RepTwitterHandle please protect #BroadbandPrivacy. 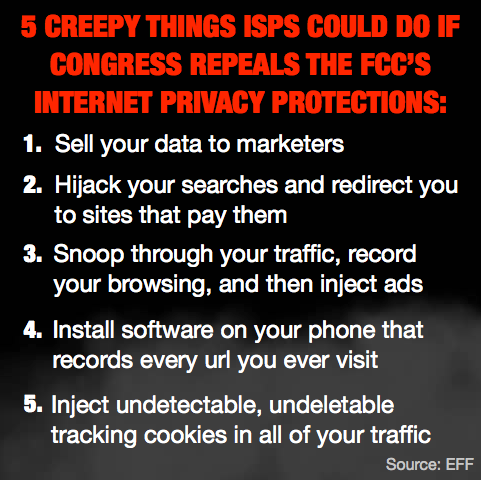 Don’t let ISPs sell my personal information.